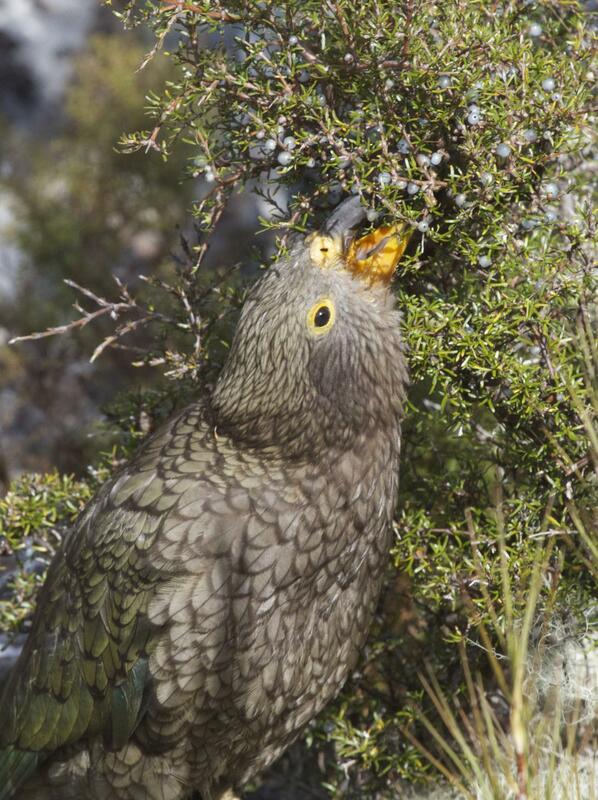 The kea is an unusual parrot. 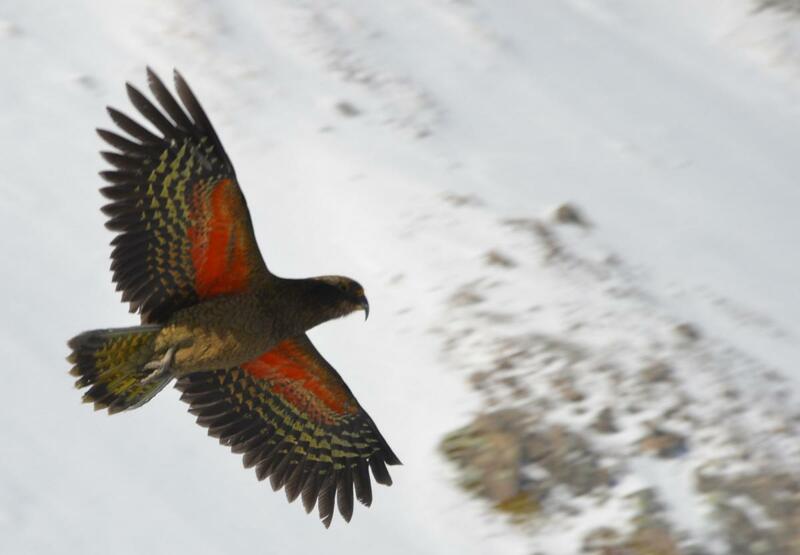 It is the only truly alpine parrot in the world, and gained early notoriety among settler farmers for attacks on their sheep. 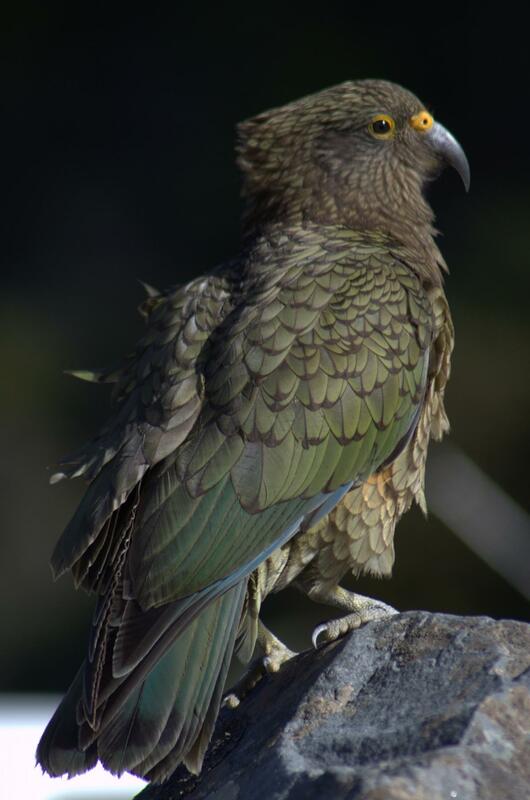 Innately curious, kea are attracted to people wherever they enter its mountain domain, and are a feature at South Island ski-fields and mountain huts. Their attraction to people and their paraphernalia is a two-edged sword, providing both new threats and new opportunities. 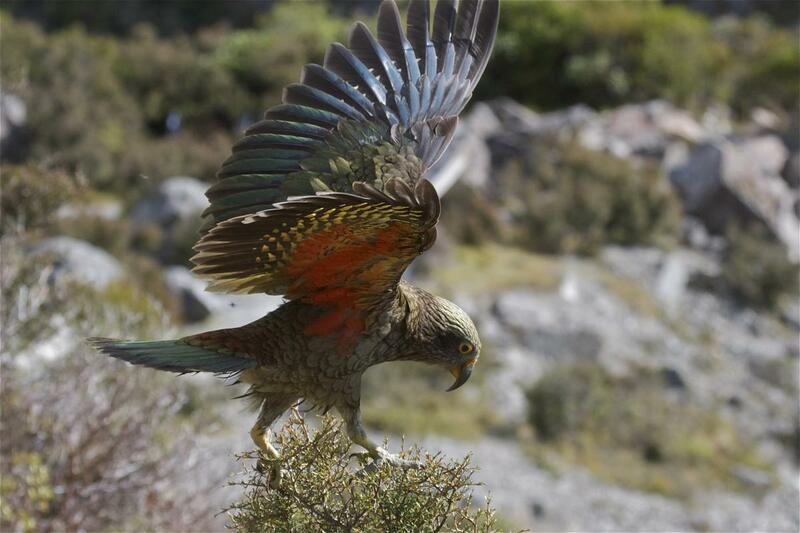 The kea is a large, strong-flying, olive-green parrot with scarlet underwings and a slender grey-black bill. Sexually dimorphic, female body mass is about 20% less than males and the bill is shorter. 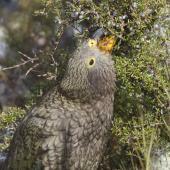 Juveniles have yellow ceres and eyelids, which fade to grey as the bird matures. The commonest call is a long, loud, high-pitched descending cry which may be broken “kee-ee-aa-aa”, or unbroken “keeeeeaaaa”. Many quiet contact calls are given. Juvenile calls are less stable in tone, being more of a loud uncontrolled whooping or squealing. 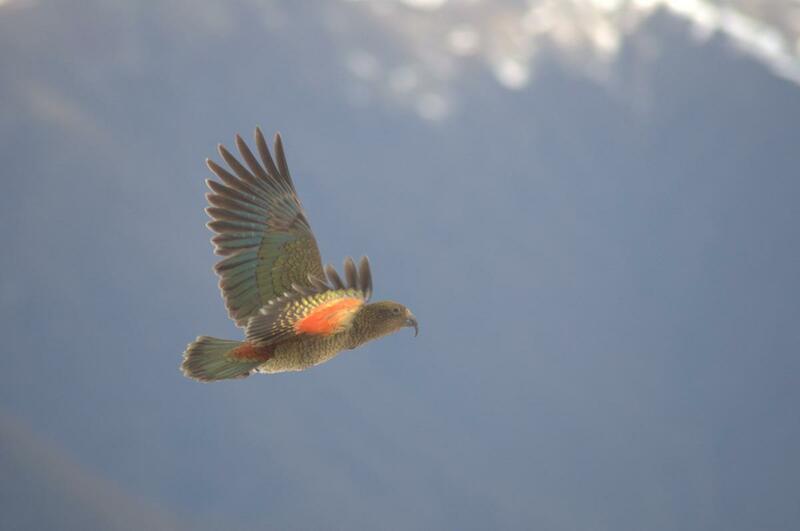 Kea are unlikely to be confused with other species. 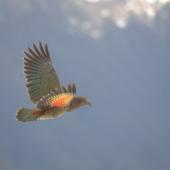 Kaka are smaller, olive-brown and very rarely seen above the timberline. 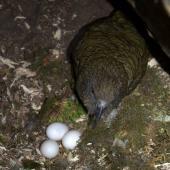 They excavate the wood of live trees, whereas keas do not. 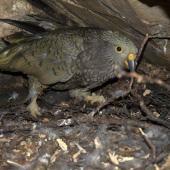 Kaka have more varied calls, including fluting whistles and harsh grating ‘skraaarks’. 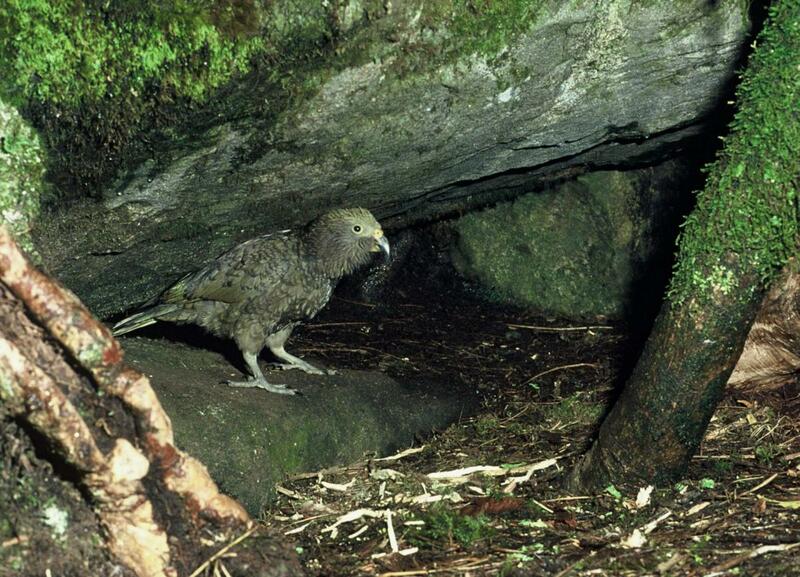 The extremely rare and localised kakapo is larger, flightless and nocturnal. It is yellow-green rather than olive-green and lacks a scarlet underwing. 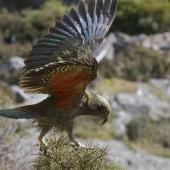 Kea range over about four million hectares along the axial ranges of the South Island, from Farewell Spit to Waitutu, plus the Kaikoura Ranges. They can be found from coastal dunes to high alpine peaks, but are most common in montane forests and adjacent subalpine and alpine zones. 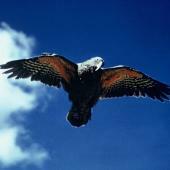 They are absent from the Marlborough Sounds, Catlins, Blue Mountains and both the North Island and Stewart Island. 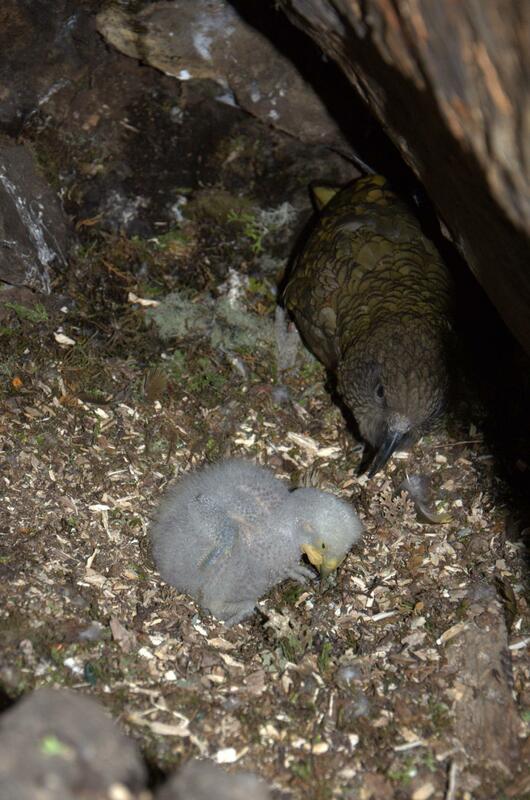 Kea mainly nest within native forest. 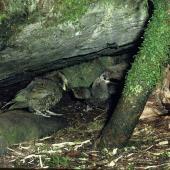 Their foraging habitat includes all types of native forest, sub-alpine scrub, tussock and herb-field. 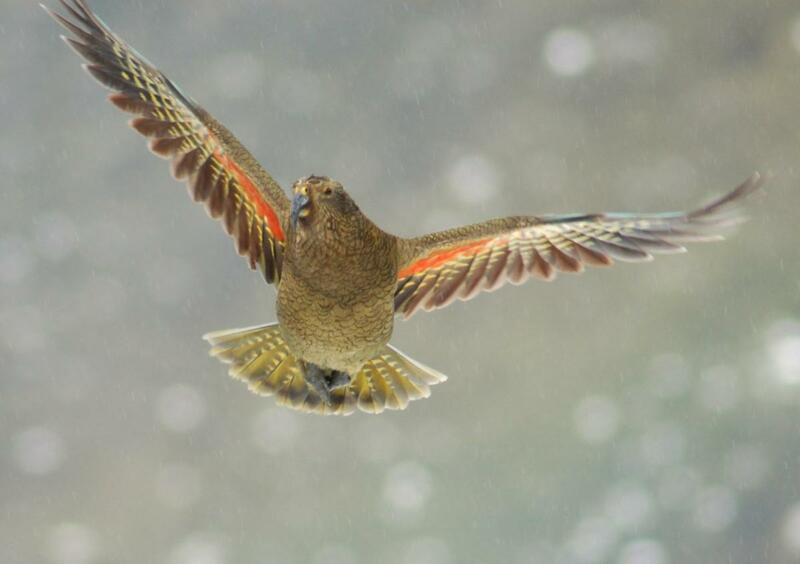 They socialise on prominent rocky outcrops and windy saddles above or below the timberline, and are frequently reported in pine forests adjacent to native forest. 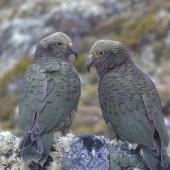 That the kea persists despite the shooting of 150,000 birds between 1860 and 1970 indicates a high reproductive potential. Fats and proteins scavenged from the carcasses of deer and sheep may have boosted productivity among the reclusive breeding adults. Juveniles were probably disproportionately culled, being more gregarious, conspicuous and inquisitive than adults. 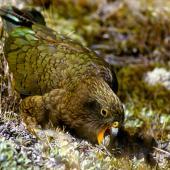 Bounty hunting of kea as a measure to protect sheep was outlawed in 1971, and full protection was finally granted in 1986. Contemporary threats include introduced mammalian predators, environmental lead, and conflict and accidents with humans and their equipment. 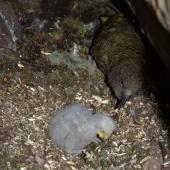 Episodic, semi-catastrophic mortality events are thought to be associated with plagues of stoats which ensue after mast seeding of beech and rimu. 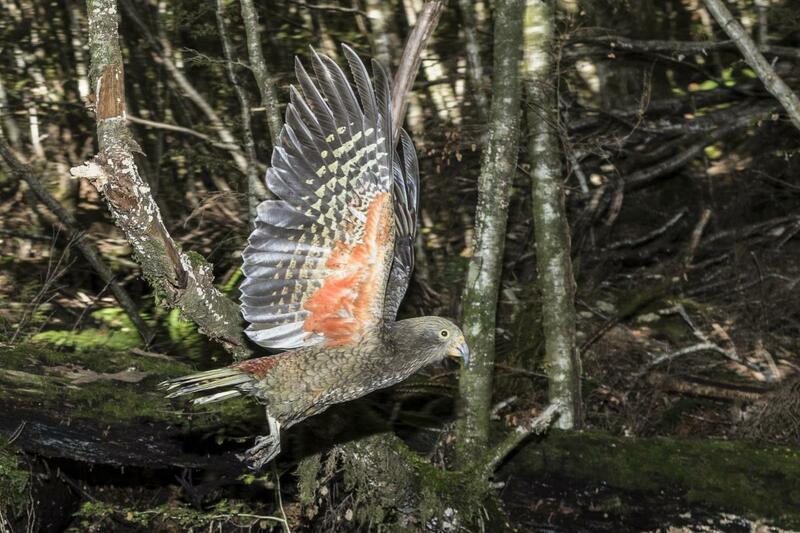 Ironically, kea are also killed accidentally in possum traps and by poison baits deployed to control predators. 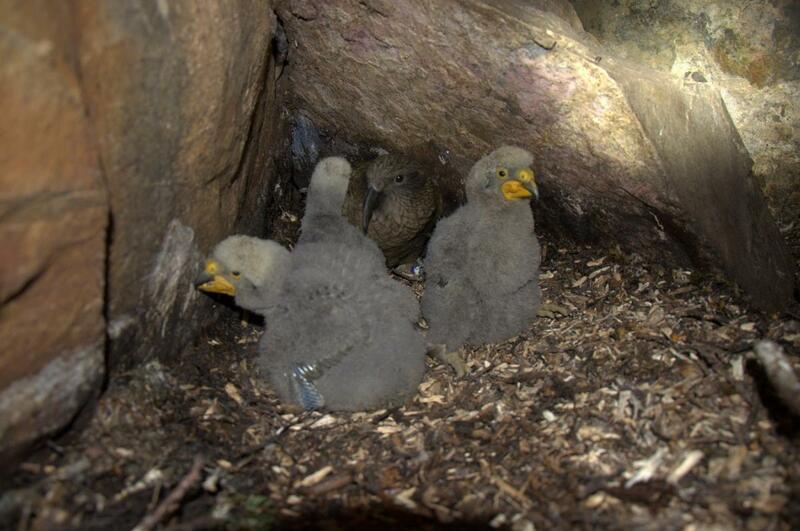 Predator control has been associated with substantial increases in nest survival and therefore in recruitment of young birds. 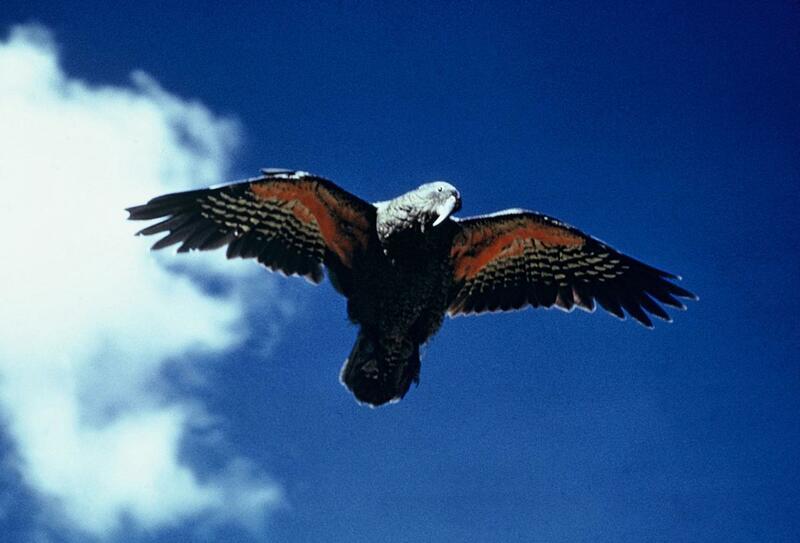 The conservation status of this species was changed from naturally uncommon to nationally endangered in 2013. Normally one clutch is laid per year. 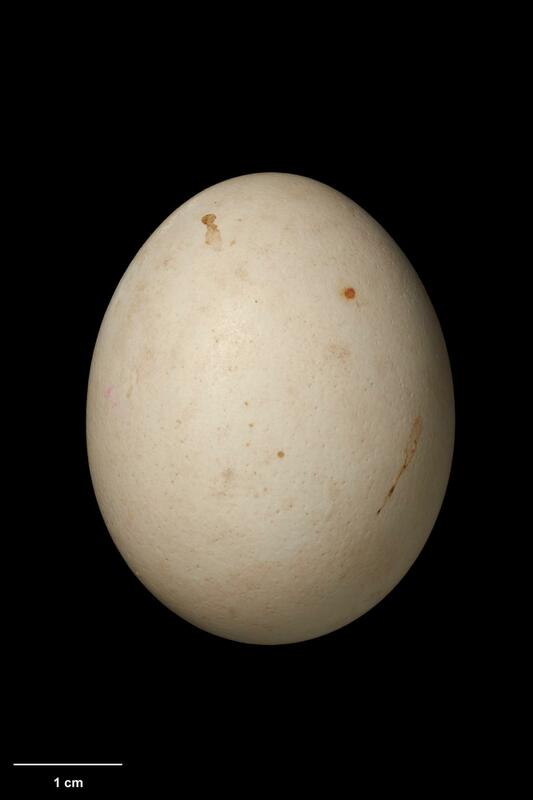 An individual female may nest in several successive years, but not all females nest every year. 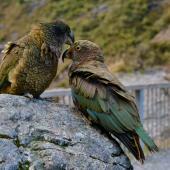 Kea are monogamous, with long-term pair-bonds. Reports of polygamy were not upheld by radio tracking studies. 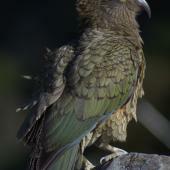 Juvenile kea congregate in loose, wandering flocks. 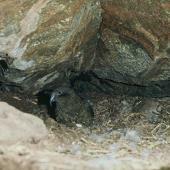 Breeding adults may join flocks when they pass through their home range. Flexible social hierarchies develop within flocks. 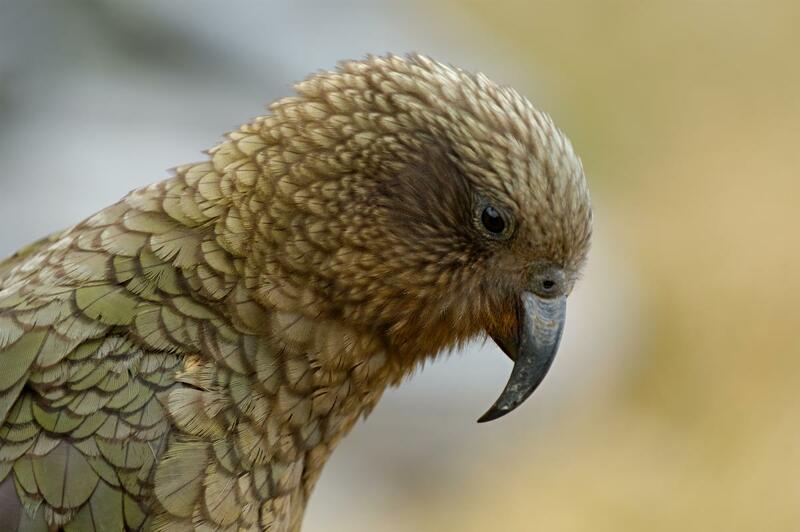 Kea are considered highly intelligent compared to other parrots, birds and even mammals. 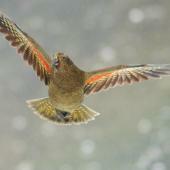 Juveniles are tolerated by unrelated adults and this facilitates learning of complex foraging skills. 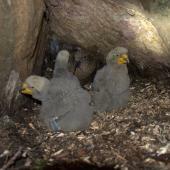 Juveniles ‘play’, and the juvenile period is long compared to other parrots. 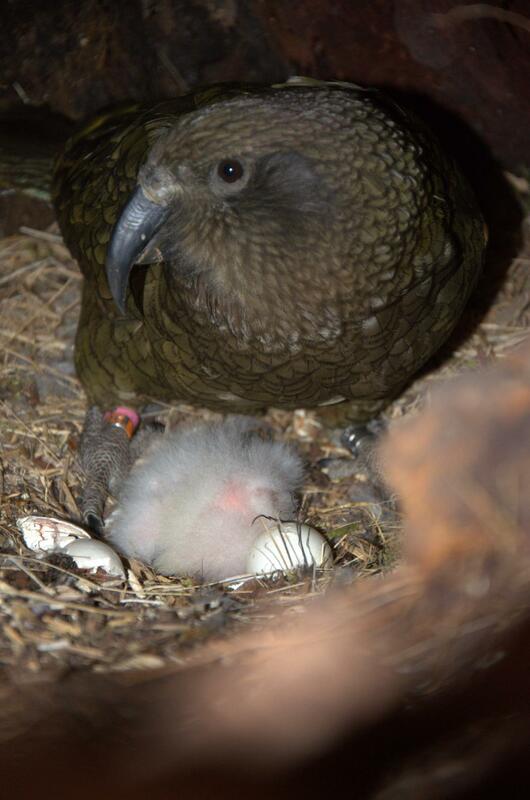 Adaptability is a key part of kea ecology. They have benefited from some human-induced modifications to their habitat, including scavenging from dead deer, chamois and tahr shot by hunters, digging for huhu grubs in pine forestry areas, and digging for grass grubs in pasture. 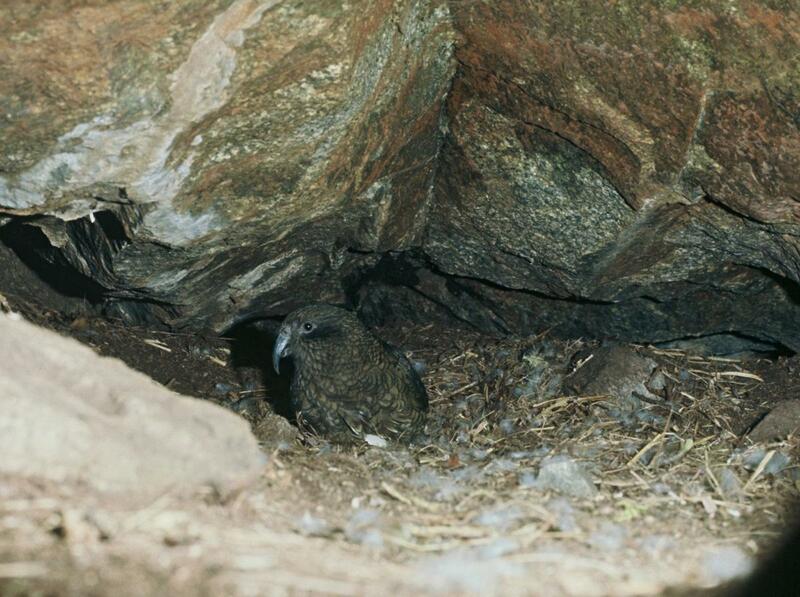 Distinctive behavioural and morphological traits of kea compared to other parrots include the slender bill, digging for food, ground nesting, winter breeding, social dynamics, intelligence, prolonged juvenile phase and use of alpine habitat. This combination of traits indicates an evolutionary history in an unforested habitat. 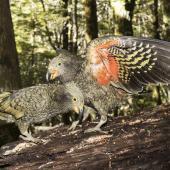 It is likely that these characteristics evolved from a kaka-like ancestor during uplift of the Southern Alps over the last 5 million years. 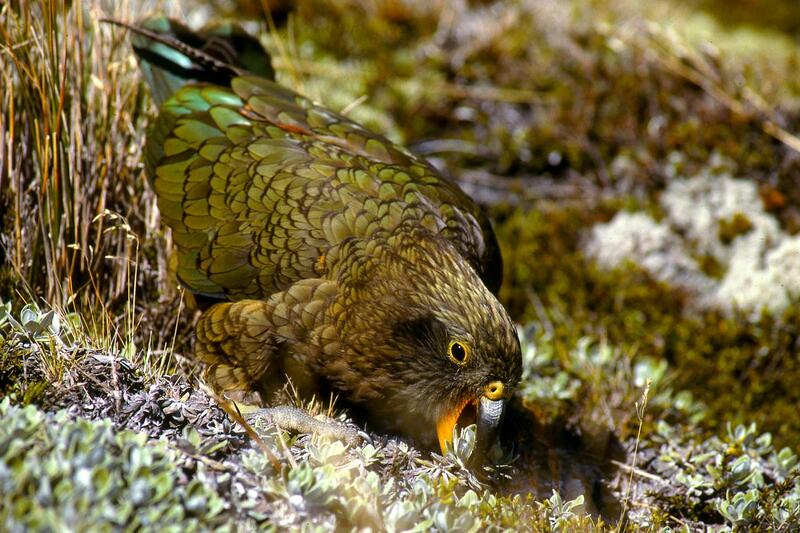 Kea may have an important role in dispersing seeds of alpine plants. 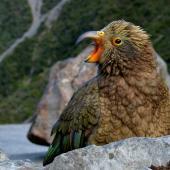 Kea are omnivorous, taking a wide range of plant and animal matter. They forage in trees and scrub for shoots, fruits, leaves, nectar and seeds, dig in the soil for insect larvae and plant tubers (e.g. 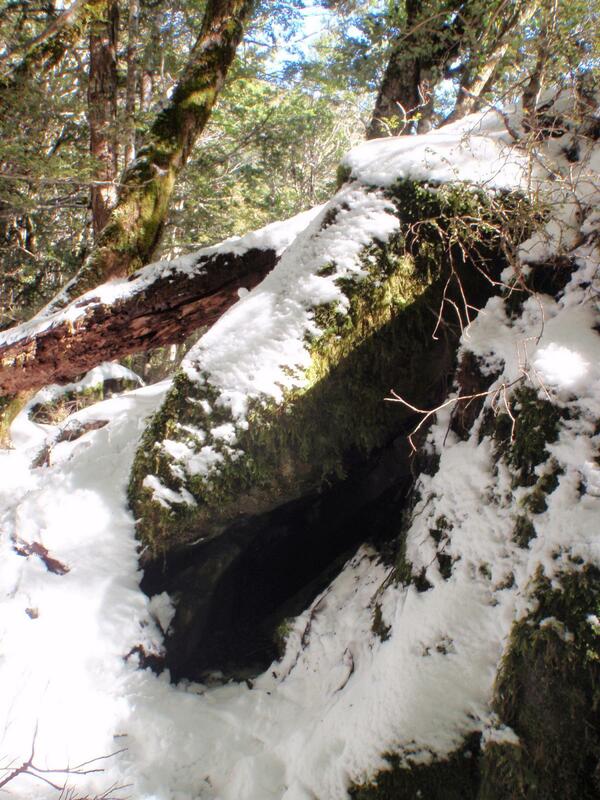 native orchids), and excavate rotten logs for huhu grubs, especially in rimu forests and logged pine plantations. 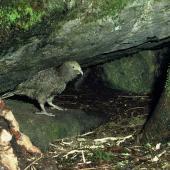 A few kea prey upon Hutton’s shearwater nestlings in the Seaward Kaikoura Range, and throughout their range they scavenge from carcasses of deer, chamois, tahr, and sheep. Some birds perch on sheeps’ backs and dig through skin and muscle on the rump to reach the fat around the kidneys, which can result in fatal septicaemia. 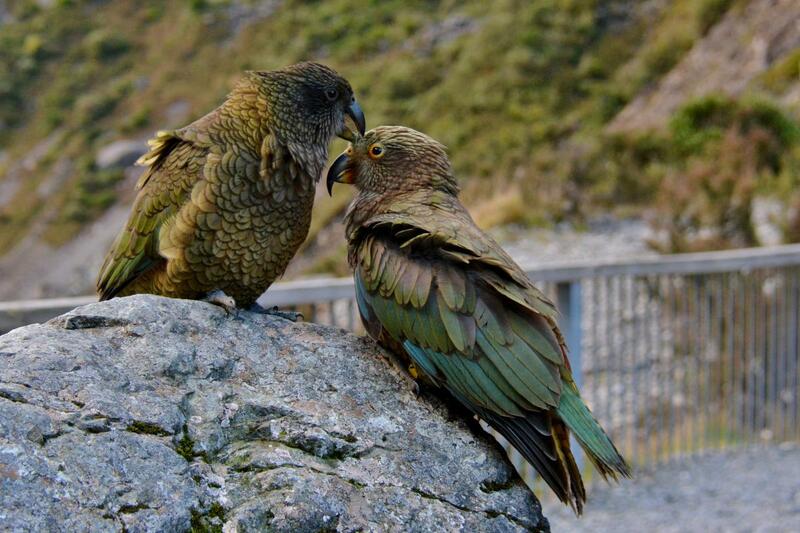 This behaviour is not common, but was the reason why kea were persecuted for over a hundred years. Anderson, R. 1986. Keas for keeps. Forest & Bird 17: 2-5. Bond, A.B. ; Diamond, J. 1992. 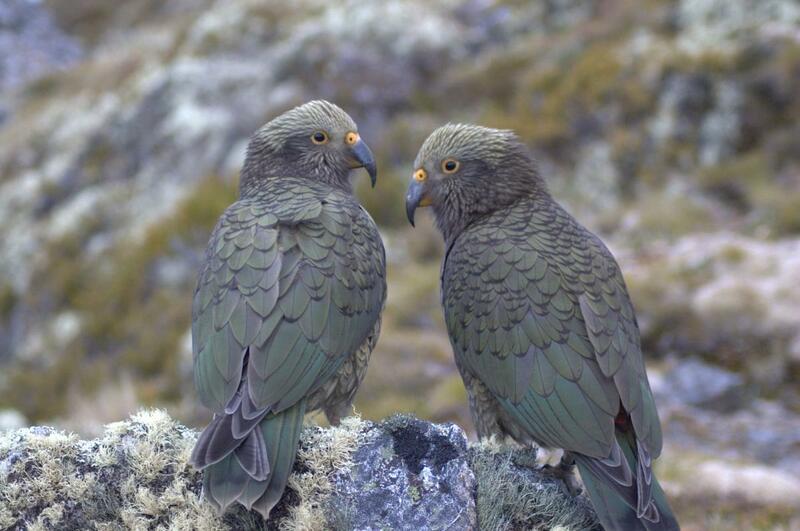 Population estimates of kea in Arthurs Pass National Park. Notornis 39: 151-160. Bond, A.B. ; Diamond, J. 2004. 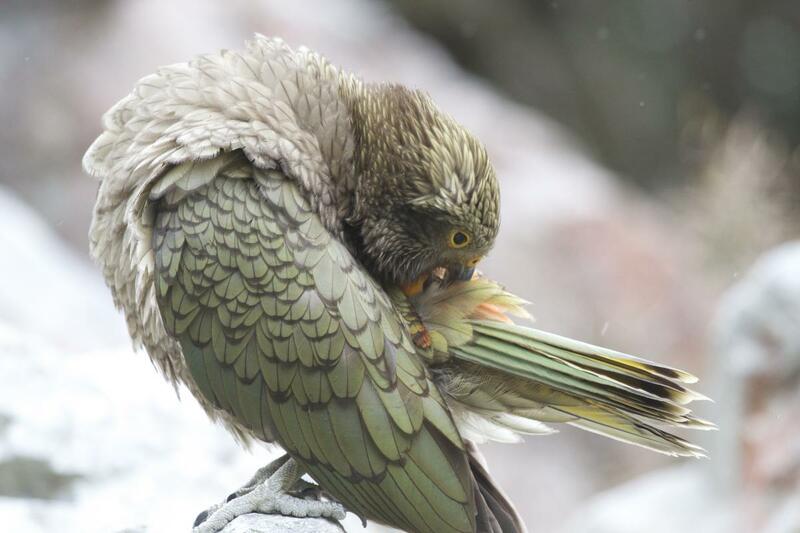 Geographic and ontogenic variation in the contact call of the kea (Nestor notabilis). Behaviour 142: 1-20. Bond, A. B.; Wilson, K.-J. et al. 1991. 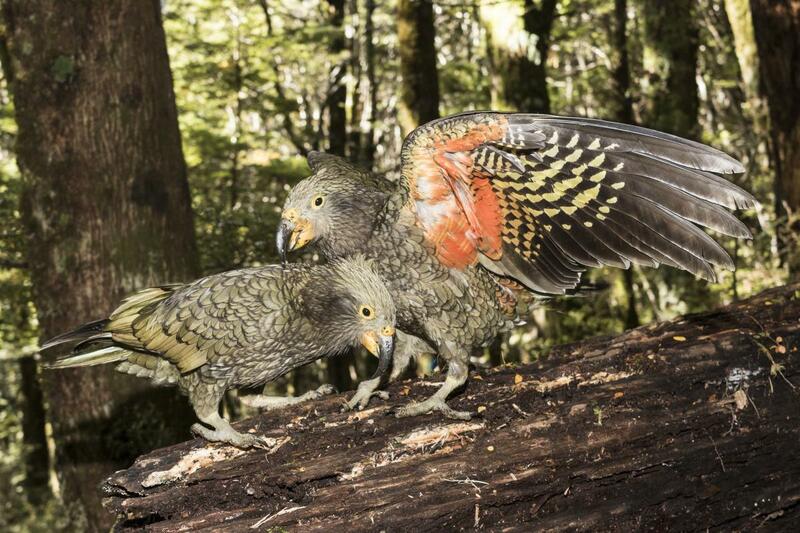 Sexual dimorphism in the kea Nestor notabilis. Emu 91: 12-19. Clarke, C.M.H. 1970. 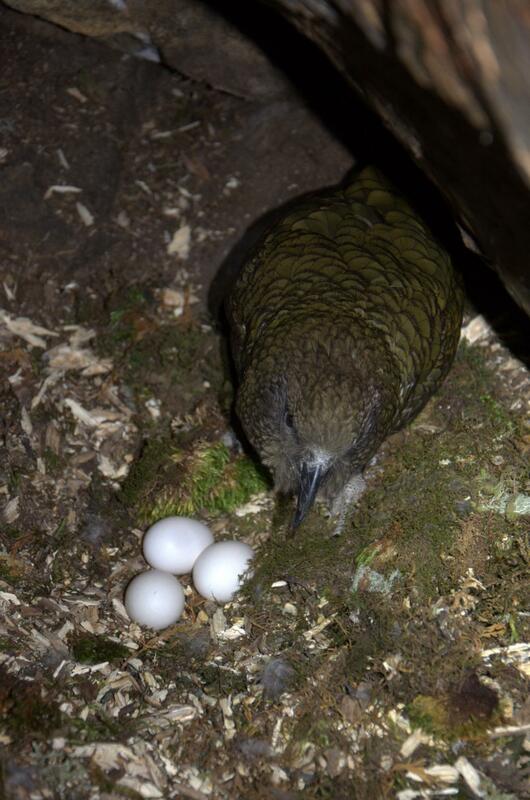 Observations on population, movements and food of the kea (Nestor notabilis). Notornis 17: 105-114. Diamond, J.; Bond, A.B. 1991. 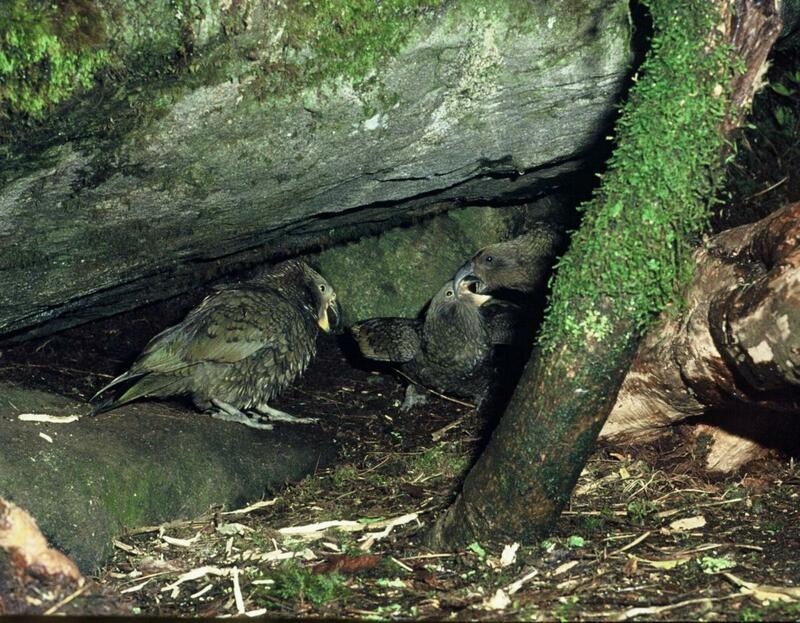 Social behavior and the ontogeny of foraging in the kea (Nestor notabilis). Ethology 88: 128-144. Gould, J. 1856. On two new species of birds (Nestor notabilis and Spatula variegata) from the collection of Walter Mantell, Esq. 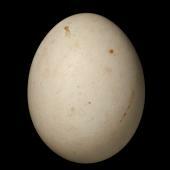 Proceedings of the Zoological Society of London: 94-95. McLelland, J. M.; Reid, C. et al. 2010. 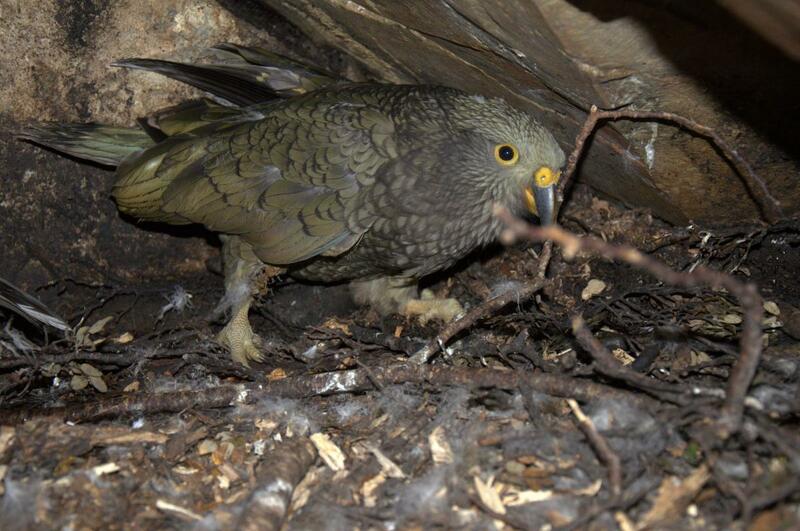 Evidence of lead exposure in a free-ranging population of kea (Nestor notabilis). Journal of Wildlife Diseases 46: 532-540. O'Donnell, C.J.F. ; Dilks, P.J. 1986. 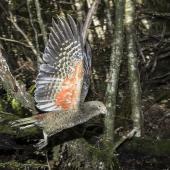 Forest birds in South Westland; status, distribution and habitat use. 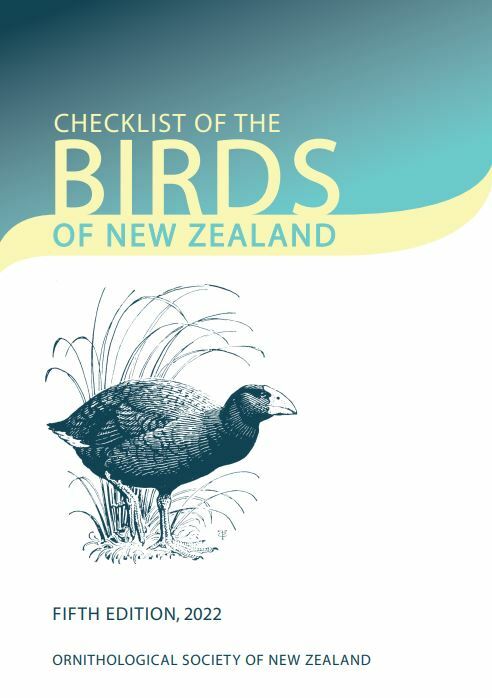 New Zealand Wildlife Service Occasional Publication No. 10. Robertson, C. J. R.; Hyvonen, P. et al. 2007. 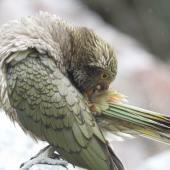 Atlas of bird distribution in New Zealand 1999-2004. 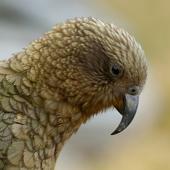 Wellington, The Ornithological Society of New Zealand, Inc.
Robertson, H. A.; Dowding, J. E.; Elliott, G. P.; Hitchmough, R. A.; Miskelly, C. M.; O’Donnell, C. F. J.; Powlesland, R. G.; Sagar, P. M.; Scofield, R. P.; Taylor, G. A. 2013. 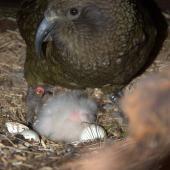 Conservation status of New Zealand birds, 2012. NZ Threat Classification Series 4. Department of Conservation. Wellington. Wilson, K.-J. 1990. 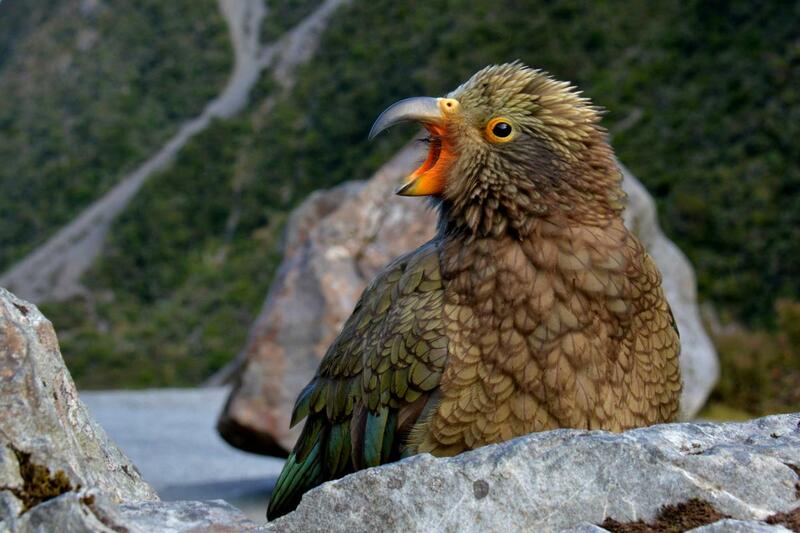 Kea, creature of curiosity. Forest & Bird August 1990. Young, L. M.; Kelly, D. et al. 2012. 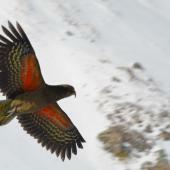 Alpine flora may depend on declining frugivorous parrot for seed dispersal. Biological Conservation 147: 133-142. 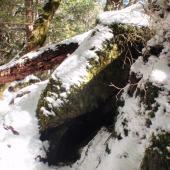 Cavities highly variable, including naturally formed rock crevices, hollow logs, hollows under roots of trees and hollows in banks. A crude nest bowl of dried wood chips and moss. A large olive-green parrot with orange underwings and rump, a slender grey-black bill, and blue-green iridescence on the primary flight feathers. Females are 20% lighter than males with a shorter bill, and juveniles have a yellow cere, lower mandible and eyelids, which fade to grey as the bird matures.